Malcolm Macdonald writes: On rereading Dickens’s "Oliver Twist" recently I found myself wondering – not for the first time – what magical storytelling powers impelled me to persist with a plot that has more holes than a net curtain. To be precise, there are 26 Incredible Coincidences, 21 Unanswered Questions, and 5 Plain Impossibilities; so there is hardly a page on which you do not stumble over one or other of them; there is hardly a page where you are not forced to turn back to check an incongruity only to read onward with a sigh. But read onward I did! This was very odd. All my own novels (33 and counting) have been through the editorial mills at Cape, Hodder, Headline, Knopf, Simon & Schuster, or St Martin's Press; through them I have learned something of the immense skills and the acute critical insight that goes into the making of the modern novel. So I wondered how "Oliver Twist" would have fared if Dickens's ms had been put through one or other of those expert mills. Actually, that would have been impossible. The story appeared in two-weekly instalments in Bentley’s Magazine. The Great Man wrote Chapter One with only the cloudiest notion of what would be in Chapter Two (an almost impossible fourteen days away), and even less did he know of Chapter Three (an infinitely distant futurity). As for subsequent chapters … oh, please! Most of the annoyances and arbitrary-seeming misdirections of the plot stem from this unavoidable fact of Dickens’s life: He was too damn busy to go through the normal process of structuring a plot and then writing and refining his story through several drafts before letting the first chapter appear. Even so, the story is sheer magic. But how much better might it have been? 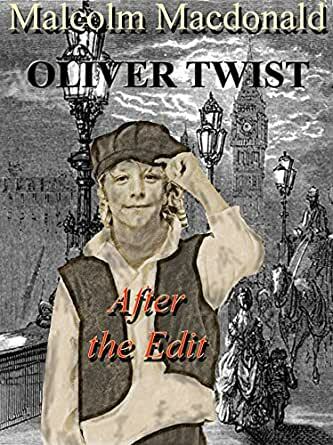 "Oliver Twist - After the Edit" is my guess at what a modern, no-pulled-punches editor would have made of "Oliver Twist" had it landed on his desk, entire but still in manuscript form. It is at once both light-hearted and entirely serious - a contribution to the joys of reading and to the serious annals of literary criticism. However you choose to take it, I hope you will enjoy what I have dared to do.